The Nashville Predators are the only team in the NHL a without a loss in regulation. The last time the Predators had a streak such as this was in the 2010-11 year where they were unblemished through the first eight games of the season. The Preds have started the year on a streak and look to continue their undefeated mark against the Pittsburg Penguins tonight at Bridgestone Arena. With former Preds, Patric Hornqvist and Nick Spaling, the Penguins have been their traditional offensive self early on this season. With amassing 22 goals and a powerplay of 36.36%, thePenguins know how to put the puck in the back of the net. As always, the Penguins have All-World players in Sidney Crosby and Evgeni Malkin to lead their team. The two players have put up 18 points together for the Penguins. During this past offseason, it has been well reported of the trade between these two teams. The Preds were in need of a true goal scorer and they got that in James Neal. Having to give up a fan favorite in Hornqvist was difficult, but has benefited both sides. “The Real Deal” James Neal already has 5 goals one the season and a natural hat-trick in their last outing. Patric Hornqvist has benefited being on the first line with Crosby and Chris Kunitz. Hornqvist has 4 goals on the season with 8 points. Preds Powerplay vs. Penguins Penalty Kill-Ranked 21st in the NHL on the PK, the Penguins have a 77.8 PK%. We all know the glaring weaknesses of the Preds PP. Ranked 26th in the league with a 8.7 PP%, the Preds will need to take advantage of their weaker PK. Advantage: NO TEAM. The 1st line of the Nashville Predators has produced for the team better than any other line. 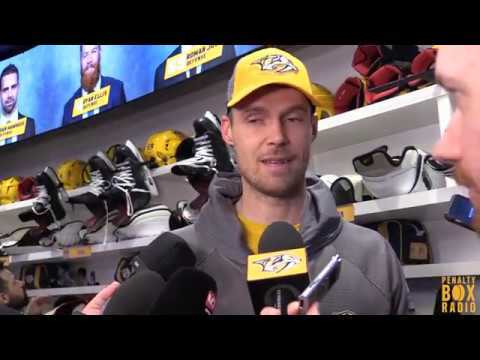 Ribeiro, Forsberg, and Neal are showing the ability to work as a cohesive unit to put up points. Eighteen points with 9 goals, look for this line to continue to score and lead in goal scoring. Tonight’s matchup will be a crucial one for the Preds. This will be the last home game until November 11th. Puck drops at 7pm. You can go out to Bridgestone Arena for James Neal Bobblehead Night, watch on FS-TN, or listen live on 102.5 The Game.